This is a Peter Cook fan website. Learn, look, link, list, fan. Let's see how long we can make this list! 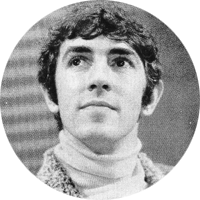 Just take a look at it - what a glittering "who's who" of Peter Cook fans! Then add your own name for Internet posterity. If you're already listed, drop me a line if you'd like to update your info! If you have a website or somesuch and would like to display your fannishness loud and proud, take one of these link banners! Without further ado... here's the list!! Angela Scotland "frog & peach"
Aya Canada "One Leg Too Few, Frog & Peach"
bampop Scotland "bloody greta garbo sketch and all derek and clive"
bronte Australia "Cant decide but i do especially love his attributions to Private Eye and The Establishment"
'Crack' Mancini England "Derek and Clive"
dario salvi Italy "Hello ! and One Leg Too Few !!!" Eddie Armstrong United Kingdom of Great Britain and Northern Ireland "Derek And Clive but everything he's done really." Elyse United States "The Princess Bride"
Emily United States "All - but if I had to choose a favourite: Anything he does as E.L. Wisty"
Fifthhorseman England "Drimble Wedge & The Vegetations"
FOR5 England "Entirely A Matter For You"
Gretchen Long United States "Bedazzled"
Harriot Harkus Australia "His face." Heather United States "the frog and peach"
hollyberry England "Father and Son"
Ina England "Beyond the Fringe"
Jake Hughes England "Crime and Punishment"
jimmy mclaren Scotland "slowly working my way thru everything so all"
Joe Pick England "Derek & Clive"
Jonny Bailey Thailand "wonkey house......."
jude borown England "would you like a sweetie"
Katelyn United States "Beyond the Fringe"
Kerry Canada "Blackadder season one, episode one!" Kieran McNulty United States "All!" Kim Lee Harvey England "Bedazzled"
Lee Singapore "Pete and Dud, One Leg too Few"
Lisa United States "Any Pete & Dud sketch." Mariela Argentina "Not Only...But Also"
Marlies Matthews-Williams Germany "anything with Dudley Moore"
martian Ireland "derek and clive"
MO England "FACTS OF LIFE/BIT OF A CHAT"
mrsPLG Greece "Oh One legged man.interesting facts,frog and peach,the miner,oh and many many more!!!!" Nancie Canada "Ad Lav Club/One Leg Too Few"
Norman House England "Frog and Peach"
Olivia_Cook_Obsessed Australia "i dont want to sound original but i always love peter!" Paulette LeMieux United States "Bedazzled"
Profpetercook South Korea "Alan a dale"
Rachel C United States "ALL"
Rosey United States "Beyond the Fringe"
Ryon United States "Whoops Apocalypse"
Sir Arthur Streeb-Greebling England "Ravens"
Sophie England "Bloody Greta Garbo!" Susan Schutt United States "EL Wisty and Sir Arthur Streeb-Greebling"
The Drinking Man Wales "Frog and Peach"
unclebertie England "one leg too few"
vvolpe United States "The Derek and Clive Albums"
William Gladys England "Too difficult to choose." "Good evening." Since 2005, by Deanna. No copyright infringement intended. Thank you Typebig for the layout. Goodbye again.